Quick Review: Water pooled around my feet, rising at an alarming rate. 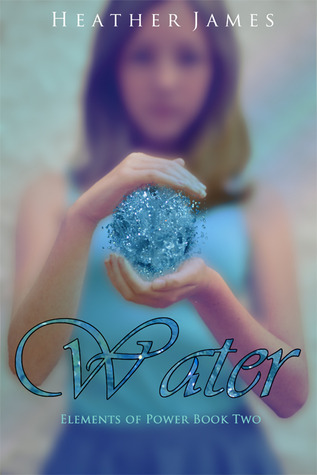 I stared - panicked - at the palms of my hands, willing the water gushing out of them to stop as miraculously as it had begun. Jasmine is struggling to control her new powers, causing floods and fires with an accidental flick of her wrist. In a desperate attempt to master at least one aspect of them, she travels to the Brizan Realm, where she comes closer to discovering the truth about her parents than ever before. But not everyone wants their secrets revealed. Alone, powerless and, for the first time in her life, afraid, Roxy has only one thought occupying her mind: escaping Cinaer's clutches before it's too late. Her flight will take her across the ocean, but not in the direction she is expecting. Before she can try and get back to Brae, she needs to rescue herself. Despite being on opposite sides of the world, the girls soon find themselves closer than ever. Detailed Review: I am in love with this book. Heather James has once again broken and satisfied my heart. Every word she wrote, every page was so filled with delicacies that it makes you want to devour the book all at once without even stopping to chew through it. That's what Water is. It's like a favourite food you'll never get tired of eating. The story has once again entranced and captivated me with its numerous twists and surprises together with its characters. It is written in Roxy and Jasmine's points of view. And besides that, it actually gives us a more brief look into two of the four realms. In Water, we get to know more about the Sephans and the Brizans. Jasmine, thought to have been a descendant from Helian and Brizan parents, decides to follow her best friend and the Arcan prince Brae to the Brizan realm so she can control the Brizan part of her powers and to find out more about her parentage. But what she finds will shock her. Roxy, on the other hand, is being controlled by Cinaer and her control-freak mother. Cinaer is determined to use her to gain the throne. When given a chance to escape, she takes it and embarks to the Arcan realm. But something happens before she reaches it. She finds herself in the Sephan realm instead. Now, the Sephans, they're like us in the present. They have a democracy. But they do not have technology. They depend completely on nature. So in a way, they are like a bunch of intelligent cavemen (pardon me, Heather, I couldn't find a better phrase to describe them). It is in these two different realms that the two girls, Roxy and Jasmine find themselves so close, no matter how far apart they seem, connected in a way they could never imagine. The ending: makes me want to cry and stage a protest against the author for writing such heart-breaking endings. I was not prepared for that. Brief Review: I am once again impressed by Heather. Her characters are very powerful with their personalities, especially the girls. Jasmine and Roxy are both amazing heroines. And perhaps it is the idea of having two heroines, not just one that makes the book unique in it's own way. The story itself is already interesting enough, but the characters just makes it even more vibrant. Great review, Elicia! I love the cover. It's exquisite.